Probably the most obvious application of tethers is to use them to connect satellites and thus keep them together. In orbit, spacecraft that are initially close together tend to slowly drift away from each other. This may be because they were put in orbit with slightly different initial velocities, or because they are orbiting at somewhat different altitudes. Moreover, Earth is not perfectly round, and as a result its gravity field is not exactly the same everywhere at a given altitude. Satellites at different locations thus experience slightly different disturbances in the gravity field and eventually start to move in different directions. 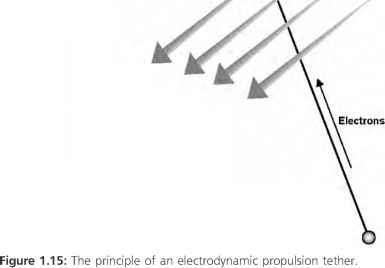 Propulsion with small rocket thrusters can be used to push back satellites that drift away from their positions, but that requires propellant. Eventually the propellant runs out and then there will be no way to keep the spacecraft under control. Moreover, to keep track of the spacecraft's position with respect to other spacecraft, we will need to equip each satellite with accurate position measurement sensors. The necessary propulsion and sensor equipment adds complexity and risk, and increases the mass and cost of the satellites. In addition, there are formation-flying applications for which even the smallest amount of thrust can be too disturbing. Using tethers, we can build up a constellation of physically interconnected satellites that act as a single, much larger spacecraft, without the need for propulsion and complicated sensors to keep the cluster together. For example, a large radio astronomy antenna dish, requiring a very large spacecraft, could be replaced by a series of smaller antennas on smaller spacecraft. For these small antennas to work together and function as a single large dish, they have to remain very accurately positioned with respect to each other. The simplest method to keep them together is to connect them with cables and thus force them to stay in a tight formation, like flies caught in a spider's web. However, since the cables need to be long and yet light, because otherwise it becomes too expensive to launch them and too difficult to roll them up to fit in the launcher, they will need to be very flexible. That means we can pull on the tethers, but the moment we push them the cables will go slack and we lose control of our herd of spacecraft. In other words, tethers can be used to prevent satellites from flying away, but we need something else to keep them from moving toward each other. Rocket thrusters can be used for that, but they would have to work continuously and thus use up a lot of propellant, which is what we tried to avoid by using tethers in the first place. 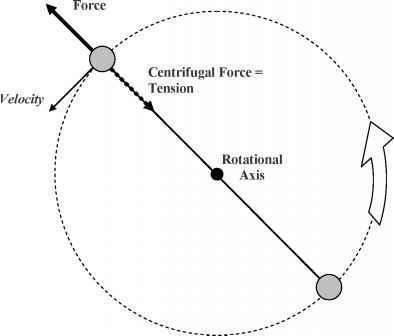 Figure 1.7: Centrifugal and centripetal forces in a rotating constellation with two masses or satellites. by the rapid rotation, while the taut ropes prevent them from shooting away due to equal but inward directed centripetal tension forces (Fig. 1.7). The downside of this method is that the group of satellites needs to rotate; their relative positions may remain fixed, but to the rest of the universe the satellites are constantly moving. 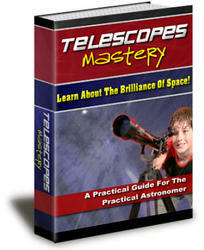 This is not practical for many formation-flying applications, such as observing a planet or a star. There are, however, other ways to push spacecraft away from each other that do not use propellant and that can be combined with tether interconnections. This will be explained later (see Let's Stay Together, in Chapter 5).